OTTAWA - Irwin Cotler, the longtime Montreal Liberal MP, former justice minister and human rights advocate, won't be running again. Cotler, a prominent member of the Jewish community, made the announcement to his Liberal caucus colleagues Wednesday. He said he plans to remain the Mount Royal MP until the end of his term in 2015. The 73-year-old was first elected in 1999 with 92 per cent of the vote but saw his support drop to 41.4 per cent in the last election. His riding was heavily targeted by Conservatives in 2011. Tory robocalls suggested Cotler would resign or had imminent plans to resign. 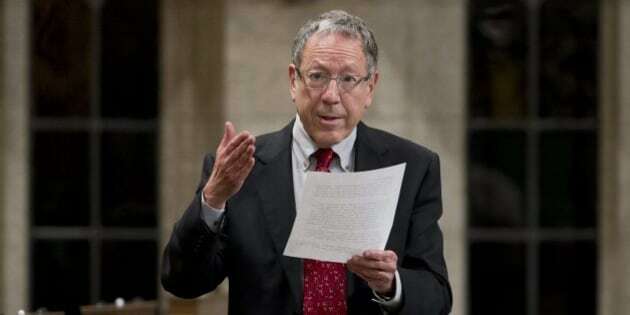 Cotler told reporters on Wednesday that the Tories actions had played no role in his decision to step aside but wedge politics on the issue of Israel had contributed to the fact that he had lost the Jewish vote in his riding. "My sense is that, the next time around, I believe we will win the Jewish vote and the non-Jewish vote, (but) I hope we won't be engaging in that type of ethnic politics," he said. Health care, environment, and childcare would be the things that decide the election, Cotler said. Mount Royal is a long-time Liberal seat once held by Pierre Elliott Trudeau. Cotler said he looked forward to pursuing justice in new arenas. In January, he told The Huffington Post he would "probably not" run again but he wanted to hold off on the announcement for a few more weeks. He said his position was always to take it one election at a time. "I never saw myself as a career politician, I've probably been in Parliament longer than I ever would have assumed when I first ran ... I think I've even surprised myself how long I have stayed there," he said. "When I first ran in 1999, I viewed coming to Parliament as a temporary sabbatical from being a law professor and human rights lawyer," he said Wednesday in a statement. "However, given the support and encouragement of my family, constituents, and Parliamentary colleagues, I continued to serve in Parliament, which I consider to be one of the highest forms of public service." Cotler added he is particularly proud of his time as justice minister and Attorney General of Canada under former prime minister Paul Martin. He introduced a law to combat human trafficking and crafted the legislation that extended marriage equality to gays and lesbians. Liberal Leader Justin Trudeau praised Cotler as an essential member of his team. "He has always served me enormously with his counsels," Trudeau told reporters. "One of the things that obviously is in my mind as I serve as leader of the Liberal party and as a simple MP in this House, is how much I would have benefited from my father's advice," Trudeau said. "I knew my father well enough to know what he would have said about most things, but if ever I needed verification or confirmation particularly in the areas of rights and international issues, I would turn to Irwin to see where his thinking is and he has been an extraordinary sounding-board for me and an extraordinary friend." NDP Leader Thomas Mulcair also praised Cotler for his legal work on behalf of individuals, often human rights advocates, harshly treated by repressive governments. "Irwin Cotler is an extraordinary man here on Parliament and in life," Mulcair told reporters. Trudeau said he expects more Liberal MPs to announce they plan to step down but said he believes most of his 36 member caucus will run again. He also reaffirmed his pledge for open nomination contests. So far the front-runner in the race to replace Cotler is Anthony Housefather. The mayor of Côte Saint-Luc is a former vice-president of the Liberal Party and municipal politician for more than twenty years. Housefather, 44, told The Huffington Post he'll soon make a decision but he's so far sold hundreds of party memberships and has consulted nearly a thousand people. "I wouldn't put my name out there if I didn't think I could win," he said. Howard Liebman, Cotler's chief of staff, was also expected to run but had a change of heart. In a statement, Liebman said he was "humbled" by the encouragement of constituents to run but he did not want to burden his young family. The Conservative Party is still expected to make the race for Mount Royal a challenge. Their former candidate, Saulie Zajdel, however, is not expected to run again. Last summer, Zajdel, who lost the riding by 5.8 per cent, was arrested by Montreal police on charges of corruption related to his time as a city councillor. He was working at the time in then-heritage minister James Moore's office as a cultural community liaison. His pre-trial is scheduled for tomorrow.